For unknown to me reasons, this work of mine is the most popular skin/theme ever with more than 1 million downloads on Internet. So I owe an update to all those who make it so popular, almost 11 years after the last update. 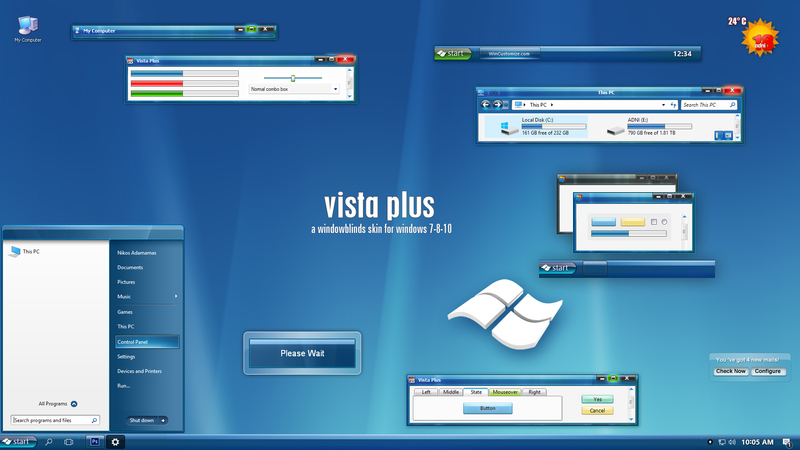 Many parts corrected, other parts altered and a substyle for Windows 7 has been added. Now works fine with Windows 7, 8 and 10. The wallpaper is included in the zip file. Thank you Nikos. This is THE Classic! My pleasure Charles, thanks for the comment! Couldn't resist this one. Thanks adni18. You are very welcome and thanks for the comment skibadee! Microsoft Blu!! .... IS EXCLNT!! Another very nice theme. I like your work adni18. One question i have anyway. Is it possible to get some stuff fixed for 4K Resolution? For example the min/max/close button. That looks a bit strange and the taskbar is also much bigger compared to a 1080p screen. May there is a problem with the DPI setting from windows. I need to use 200% DPI scaling on my laptop. Would be nice to hear from you. I love that you are updating these! Thank you so much. This one looks lovely on windows 10. You are very welcome dear Nithaiah. thanks for the nice comment! Oh Thankk you I love this skin! Thank you so much dear delve-miller! Excellent job! Love this piece of art. Q: It works in well on all windows when I open them on screen, but "all" "start menu w/programs" for windows 10, does not show/work. It doesn't make any changes there when I change to any new window blinds. Why is that? Is there a way I can fix this? Any advise, I'll appreciated. thanks.